Okay, so Sam started this refrigerator-revelation thing, and I’ve found it inexplicably fascinating to see what’s going on in other food bloggers’ fridges. It’s kind of like watching a behind-the-scenes documentary of my favorite movie – I mean, we all know the sophisticated creations that appear on food blogs, but what kinds of things do bloggers eat when they think no one’s looking? I would never have guessed, for example, that Matt eats blue cherries. Or that everyone but me seems to have a bottle of bubbly handy for those unexpected champagne moments. But it didn’t take long to realize that so far this exercise has been completely dominated by those living in the lush, sun-drenched, organic-farm-and-artisan-producer-on-every-corner utopia known as the Golden State. And since California gets more than its fair share of screen time already, I decided to join in, if only to show how some of the rest of the world lives. Oh, and also because the recipe I was intending to post about this week ended up being a miserable flop, but that’s neither here nor there. Anyhow, you’ll notice some things about my fridge. For example, it’s tiny. It is, however, standard size here for one and two bedroom apartments, and I knew a guy who lived in a five bedroom apartment whose fridge was only marginally bigger. The gigantic American-style models are catching on here, but they still remain the exception (and strictly the domain of the home-owning) rather than the norm. It’s not as bad as you might think, though. The only time we really run into problems is when we have guests coming and we buy everything for their visit in advance. At times like those I wish I had played more Tetris in my youth. Otherwise, it holds a once-a-week shop for two people quite comfortably, and it forces me to do something regularly that I know many people with monster fridges avoid like the plague: clean it out! Seriously, when I go home to visit my family I often find in the back of their fridge leftovers of things I cooked the last time I visited (and we’re talking once-a-year visits, people). That just can’t happen with a tiny fridge – everything in there is on active duty, and should something slip through the cracks it is promptly discovered during the next weekly cull. I am, however, often forced to keep things out of the fridge that normally I would keep in it – things like mustard, mayo, jam, tortillas, pickles, even eggs (which are sold here at room temperature, unlike in the US) – but considering that we’ve lived to tell the tale so far I’m not losing any sleep over it. The one regret I do have is the tiny freezer, which you can’t see in the photo, but is located behind a separate door at the top of the main fridge. It’s usually fine to store a few frozen veggies and a container of ice cream or two, but things start to get hairy when the weather turns warm and we want to have ice for cocktails (I mean smoothies – we drink far more smoothies than cocktails, okay mom? ), or we have significant amounts of perishable leftovers that we can’t bear to part with. As for saving bones and vegetable parts for stock, or stocking up on 3-for-1 whole chicken offers… well, forget it. The only other thing I’ll briefly say is that the amount of food is reasonably typical for the middle of the week (we normally do our big shopping on the weekend), but it’s actually an atypical week around here, as we’re hosting my German in-laws this weekend AND Manuel is having a birthday. So we skipped our big shop last weekend but we’ve bought a few extra things for the festivities, and more is yet to come today or tomorrow. And we did just make a trek out to Costco, which explains the large unopened packages of cheese, butter, etc. p.s. I didn’t shoot the door, because it’s full of beer and – heaven help us – more film. Oh, and a canister of Lavazza Tierra and a jar of Better Than Bouillon™ chicken base (yes, David, I’m busted too!). make oxtail soup! its a simple stew from southeast asia. no fixed recipe for it, just think hearty and happy, which is great especially with the terrible weather in edinburgh. cut the oxtail into inch thick pieces for best results. stew with veg like sweet potatoes and onions. take care! ooh i forgot the important bit. add loads of fresh coriander and chili! We Californians may have nice veggies, but I’d be very satisfied to have that French butter, Jersey milk, and gorgeous pork shoulder hanging out in my fridge. Can I invite them to my fridge for a sleepover? Also, love the cartoon baloons with the descriptions. Ahhhh….the antiquarian delight of film! How I miss it! But alas, as I said on Matt’s site, I also have a ton of canisters taking up space in my fridge, yet ever since I switched to digital last August they’ve just been gathering (baking-soda) dust. And I also wonder about the lifespan of refrigerated chipotles en adobo: I have a stash two-weeks old and was curious if it was safe to eat them or not. Looks like you have an excellent feast planned–what are you doing with the pork shoulder? Im so happy your choice of beer is San Miguel! Being Filipino, that makes me proud. I love your cheeses! But Im wondering, isnt the meat supposed to stay in the freezer? I have the same exact one, which has been in my freezer for six weeks! Can I put it down at ref temperature? Thanks! Ooh, I miss Yeo Valley! you have Costco? in Scotland? !My own chiptles in Adobe (homemade) were opened about a year ago and I haven’t dared look in the jar since. Since they were in my fridge door they didn’t make it to my own photo shoot.I can highly recommend the heston blummethal oxtail recipe – I mention it somewhere on my blog. It was perhaps the most annoying pfernickety recipe I have ever made but the outstanding results still haunt me. Oh, you’ve made a little Aussie, that once lived in Singapore, very very happy – Vegemite & Kaya – my heart is singing!! Your fridge looks happy. It’s belly is so full of goodies I won’t even dare to tell mine it also could be fed like that. Love it. Fabulous…not too pretenious, not too common. Be proud of it…regardless the size! Your speech bubbles are marvellous! That pork made my jaw drop. I never saw leftover guacamole before. I’ve got six month old chipotles, too. I’ve yet too see any go bad. Where did you find Better than Bullion in Edinburgh? I also have a tiny UK freezer that doesn’t stretch to storing stock, so I’m always on the lookout for better alternatives than Bisto. Hey, did you use Comic Life to add those speech bubbles?? Too bad about the tiny freezer, but you seem to do fine with the small fridge compartment. David – I’ve tried both the organic and regular, and I seem to get better flavor from the regular. I was almost relieved that last time I stocked up they were out of the organic, as it solved that dilemma for me. Oops, there I go putting my tongue ahead of my principles again…Matt – That is awfully romantic of you, but I’m sure everyone can see it: your fridge is waaaaay out of my fridge’s league!Ladym – Terrible weather in Edinburgh? What on earth makes you assume that? Today is sunny and beautiful! But okay, yesterday and the day before that (and the day before that) were terrible. And tomorrow, no doubt, will be too, so I’ll definitely keep your oxtail suggestion in mind.Pille – I had no idea sourdough starters would require so much effort. It’s almost like having a child – but worse, since a child wouldn’t die if I started buying bread at the store.Hmm, Brett, you might want to clear that with Matt first. I don’t think a sleepover would go over too well, what with the marriage proposal and all! 😉 But you and I could certainly arrange a trade, say a bit of my butter and milk for a few crates of your produce? Sounds fair to me!Lisa – We’ve had this enormous stash of film ever since a photographer friend of Manuel’s mother retired and gave him all the film that was collecting dust in her fridge. At the rate he’s using it, though, he’ll pass it on again when he retires! As for the pork, I made carnitas. I’m still struggling with the technique, though – I never seem to be able to get them both crispy and succulent. Any tips?Dee – I had no idea there was San Miguel in the Philippines! I’m sorry to disappoint you but ours was the Spanish version; well, as Spanish as it can be brewed under license in the UK. I’ll certainly keep an eye out for the Philippine version now that I know about it. As for the pork, it really keeps fine at fridge temperature for three or four days. Any longer and I would probably stick it in the freezer – that is, if it fits!Sam – There certainly is, thanks to this pesky little thing called globalization. It isn’t exactly the same as the US version (less of a gourmet slant, more of a wholesale feel), and being a family of 2 we really can’t even begin to justify being members, but, well, what can I say? It’s worth it for the French butter alone. And yeah, I remember your oxtail adventures only too well. I love the idea, but I break out in a sweat just thinking about that recipe…Melisa – As I see it, with those two things in the fridge both ends of the toast spectrum are covered. And the kaya is a great find for me, mainly because Manuel is freaked out by the idea of eggs in a jar and won’t touch it with a ten-foot pole!Isabel – Another great idea. I’ve always intended to make my own pho someday, particularly since it’s impossible to find in Edinburgh. Maybe that day has come?Christina – Ha ha, well it isn’t always fed that well! Some days I swear I can hear its hunger pains.Culinary Cowgirl – Aw, thanks. It does indeed do its job well, and I really should stop criticizing it. I think I’ll reward it with a good cleaning tonight.Sylee – Hey, thanks!Mary – We normally don’t have leftover guacamole either, but I deliberately made enough for two nights and hid half of it so we wouldn’t be tempted. We were, though, badly.ASMO – Great suggestion, I just found Nigel’s recipe online!Awolanna – I wish! I shlepp it back from the US with me each and every time I go. Stupidly I brought back only a couple of jars at Christmas (I should have left some of those damn presents behind instead), and I’m down to my last one – and already feeling the withdrawl pains.Tricia – You guessed it! It’s a fun toy, isn’t it? As another Edinburgh fridge owner I have also been very jealous of all those sunshine filled Californian fridges (as I am jealous of all of their wonderful spring produce), we are thankfully spared the tiny fridge even though we rent but I have certainly battled with a miniscule fridge and no freezer space before so I sympathise. I am new to the whole food-blogging world, and I love it! I love that everyone is posting the insides of their fridge. I live in sunny So-Cal, but I was subjected the the small fridge in my last studio apt. I was the same – the door was reserved for beer. I do miss those days when we never went to Costco because there was no room for anything we bought. 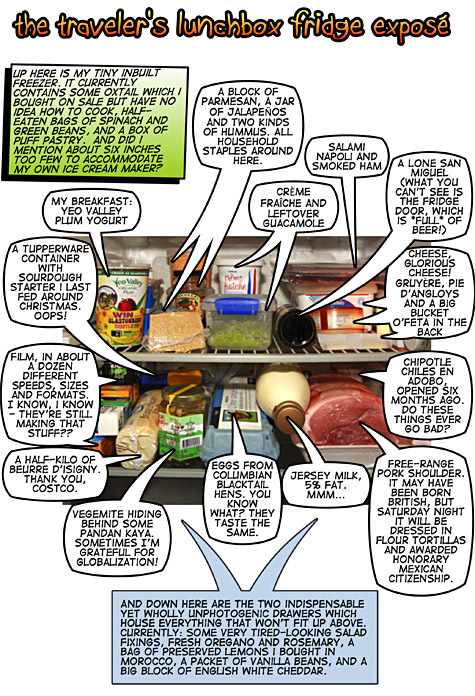 But, it’s nice to not worry about buying as much produce as I want – it’s important to take advantage of it out here.BTW, I also am fond of the comic bubbles, and was shocked to learn you have a Costco. I just found your blog while looking for Edinburgh food blogs–it’s wonderful!This most recent post is especially relevant for me. I’m moving to Edinburgh in August (from Toronto) and, as I’ve been hunting for flats, I’ve been moderately terrified at the throught of having to share a mini-fridge (well, by North American standards) with two or three flatmates. Your post gives me hope that it won’t be totally impossible . . .
i cannot believe you like pandan kaya 🙂 we eat it alot back here in south east asia. The origins of kaya comes from the peranakan background where alot of eggs, coconut are mixed totether with sugar and pandan leaves. it’s pretty time consuming jam to make as you would literally have to stand over the stove to stir the jam in order to get that smooth consistency. You’ve got impeccable taste in food and I’ve thoroughly enjoyed reading your blog. haha! i’m studying in edinburgh, actually, and when the weather is bad, its terrible! but when its sunny, its utterly gorgeous! and pandan kaya can be made with a lot more ease if you use a microwave, but the colour doesnt look great. tastes the same, though. Ummm you shouldn’t have raw meat (especially not pork) above or in contact with items which are not going to be cooked before eating (ie. your bottle of Jersey milk). Very dodgey. Jaclyn – An early welcome to the city! I’m sure you’ll do just fine on the fridge front. When I moved into student accommodation my first year in Edinburgh I just about died at the sight of my ONE allocated shelf. But you make do somehow, you know?Sienna_sunset – Thank you! Actually, I bought the kaya after trying to make my own and failing miserably. I tried to replace the standing and stirring for hours with simmering in a double boiler, but I looked away for one minute too long…and I had scrambled coconut eggs.Ladym – I had no idea you’re reading locally! I guess I don’t need to harp on about the weather to you, do I? 😉 Ed – Don’t worry, although it may not be visible in the photo that meat was safely under a layer of plastic.